* Tube List: 5670 (1), 6AK6 (1), 6AU6 / 7543 (2), 6BA6 (4), 6BF5 (1), 6DC6 (1), 6EA8 (5), 12AX7 (2). * Semiconductor List: 1N1492 (3), 2N388 (1), 2N6373 (4), 1N34A (4). * Note: There are some tube/semiconductor variations depending on vintage. 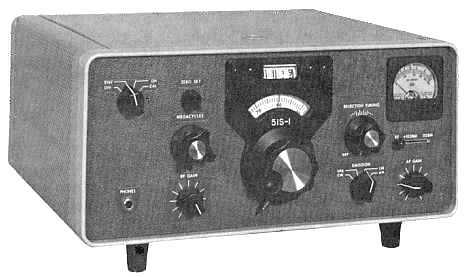 The Collins 51S-1 receiver is a versatile general coverage receiver with excellent performance in any of its three modes: SSB, CW, and AM. Frequency coverage is continuous from 200 Hz to 30 MHz using thirty selectable 1 MHz bands and a turret tuning arrangement selected by the megahertz control. The design utilizes triple conversion in the frequency ranges up to 7.0 MHz and double conversion on all ranges above 7.0 MHz. Accurate frequency determination is provided by the use of a mechanical counter for megahertz and an analog dial for kilohertz. For AM reception the passband is determined by the use of two coupled IF transformers. Selectivity in the SSB and CW modes is determined through the use of mechanical filters. Variations of the 51S-1 (base model with cabinet) include the 51S-1F (51S-1 rack mount, no cabinet), 51S-1A (has 28 VDC input power supply), 51S-1AF (51S-1A rack mount, no cabinet), 51S-1B (similar to 51S-1 with rear-mounted military connector option). 200 Hz to 30 MHz in thirty 1 MHz segments. Fixed Station attended with provisions for remote operation of RF gain. 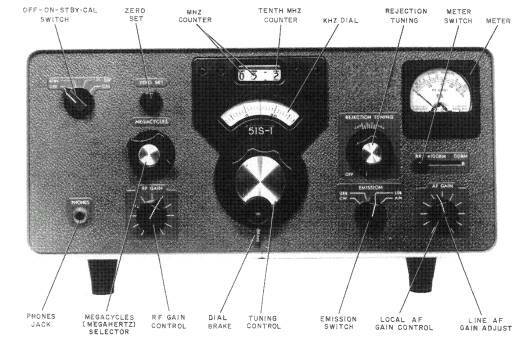 Selectable Single Sideband (SSB), CW, and AM. 51S-1/51S-1F 115/230 vac, 50-400 Hz; power consumption is approximately 125 watts. 51S-1B 115 vac, 50-400 Hz; power consumption is approximately 125 watts. 51S-1A/51S-1AF 28 VDC, 4.5 a. Image rejection better than 50 dB from 2 to 25 MHz and better than 40 dB from 25 to 30 MHz. Internal spurious signals below 1 uv equivalent antenna input. Other spurious signals better than 70 dB except for 4.8 to 5.2 MHz (better than 40 dB). Following a 20-minute warm-up and for a temperature change of from 0 to 50 degrees C: Within 885 Hz at tuned frequencies between 2 and 7 MHz; within 36 PPM (+/- 400 Hz) at 7 MHz to 27 PPM (+/- 400 Hz) at 30 MHz. Not more than 100 Hz with 10% line voltage variation. Within 400 Hz after nearest 100 kHz point calibration. Not more than 150 Hz. 3.0 uv for 10 db signal-plus-noise-to-noise ratio (2 to 30 MHz). 15.0 uv for 10 db signal-plus-noise-to-noise ratio (0.5 to 2.0 MHz). 20.0 uv for 10 db signal-plus-noise-to-noise ratio (0.2 to 0.5 MHz). 5.0 uv for 10 db signal-plus-noise-to-noise ratio, 55G-1 Preselector (0.2 to 2.0 MHz). 0.6 uv for 10 db carrier on - carrier off (2 to 30 MHz). 3.0 uv for 10 db carrier on - carrier off (0.5 to 2.0 MHz). 4.0 uv for 10 db carrier on - carrier off (0.2 to 0.5 MHz). 1.0 uv for 10 db carrier on - carrier off, 55G-1 Preselector (0.2 to 2.0 MHz). SSB (3.5 dB points, mechanical filter): 2.75 kHz (optional filter 2.40 kHz). CW (6.0 dB points, mechanical filter): 800 Hz nominal (optional filter 250 Hz). AM (6.0 dB points, IF transformers): 5.0 kHz nominal; 22.0 kHz (60 dB points). 70K-7 permeability tuned oscillator (PTO). Speaker: 3-4 ohms / 600 ohms. Phone Patch: 600 ohms. Receiver with feet: 14 3/4" W, 7 3/4" H, 14" D (37.47 cm W, 19.69 cm H, 35.56 cm D).